Next on The Scoop: Ask a Behaviorist: Why Do Cats Hang Out in Weird Places? I met Jackson Galaxy, saw dinosaurs, tasted cat food, and pondered kitty drugs in Las Vegas. 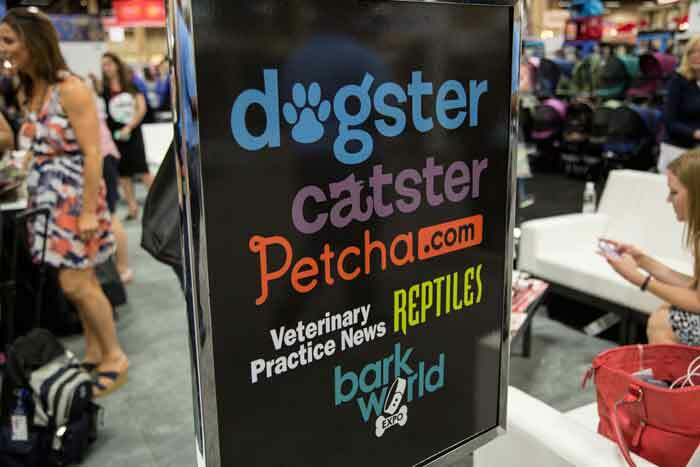 I recently braved the Las Vegas heat to check out cool new gadgets, accessories, and designer goods at giant pet expo SuperZoo. Executive digital director Janine Kahn and I had planned to cover everything in the conference halls this year, but despite logging several miles’ walking a day, we didn’t get anywhere near seeing everything. Once again, there were far fewer cat vendors than dog ones, which still bugs me — cat people love to buy stylish cat-related items, as our own Cat Chic columnist Kate Benjamin, will attest. C’mon, people — let’s get on it! Our parent company, i-5 Publishing, hosted a reading lounge with comfortable couches and piles of all our latest publications, including Catster and Dogster print mags, of course. 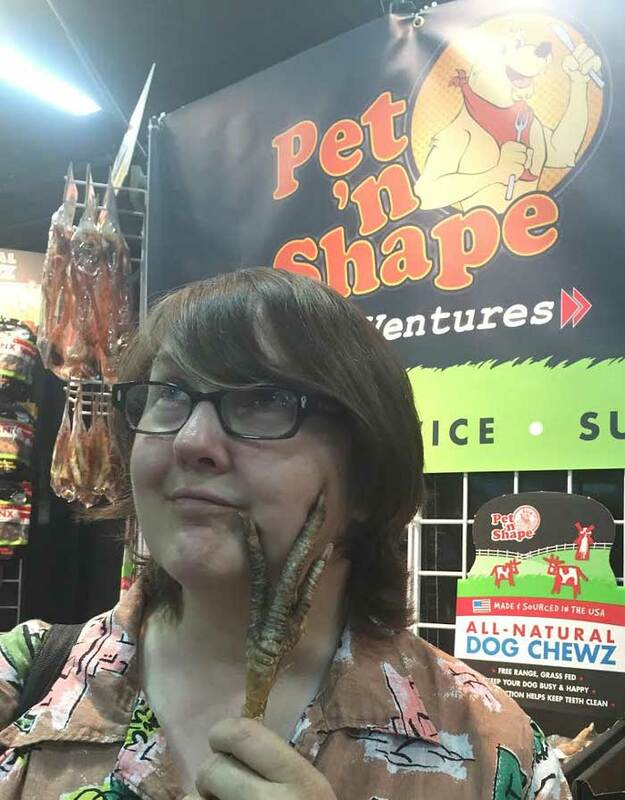 There were tons of garish and tacky toys and knickknacks, but here I focus on the things I liked best about SuperZoo. I got an exclusive interview with the Cat Daddy — we’ll share video footage here soon. We talked about his plans for the Jackson Galaxy Foundation, which is working to improve the lives of shelter animals. Jackson also walked me through his range of interactive toys for Petmate and talked about how every cat — yes, every cat — loves to play, so you need to learn what your kitty’s playing style is, if you haven’t already. My cat Gentleman Jim will gobble everything in his bowl and then puke so hard that it propels him backward, so getting him to dig his treats out of something like Jackson’s Go Fish feeder sounds ideal. I’m always looking for food for Jim that isn’t ERMAGERD FERNCY FERST, because he will turn his nose up at practically everything. We’ve tried everything in people food and just about everything in cat food. So when the nice folks at Against the Grain asked us to test their limited-ingredient grain-free cat foods, I knew I had to see what Jim was missing. I’m pulling a face for comic effect here, because the food was very tasty. It was a bland and unsalty, obviously because it’s designed for feline and not human tastebuds. If I were serving this at a party, I’d add a splash of tamari and maybe some sesame seeds and it’d make a great dip for crackers. Lots of slow feeders and interactive treat gadgets designed for dogs will work just as well for cats, as long as you realize that you’ll be forever finding kibble nuggets and treats with your bare feet. Gentleman Jim has an Aikiou Stimulo and will complain loud and long until I load it up with treats he can forage for, so these would work great for him. 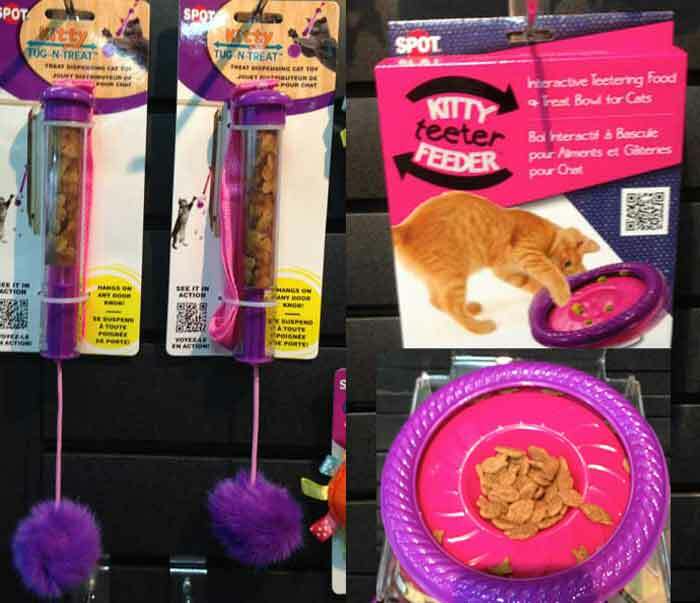 The Ethical Pet Kitty Teeter Feeder from Spot Ethical Products is a bit garish, but it’ll get your cat working for food and using a bit of his brain at the same time. I also liked the Tug-N-Treat, which asks your cat to pull a pompom to release the treats. Get your exercise, Jim! Outward Hound also has a lot of fun feeders for dogs that would work well for cats — the Fun Feeder Minis come in nice bright colors, and the Kibble Drop has four arms with different food chambers. 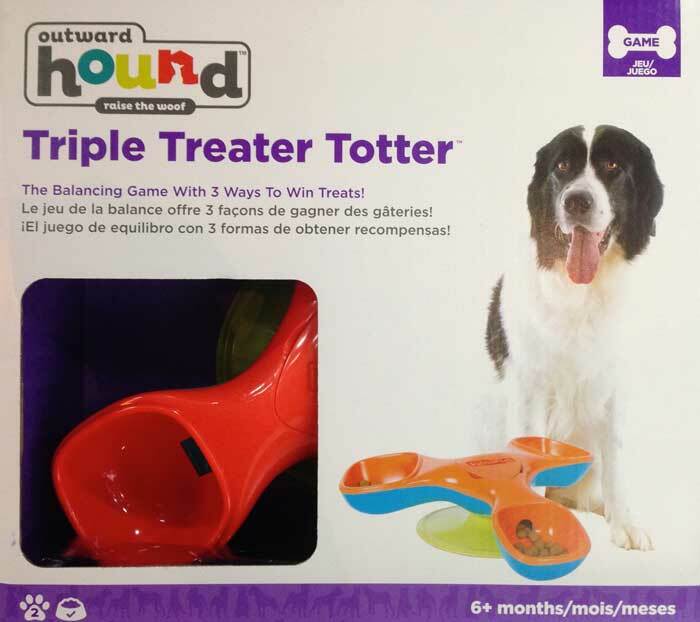 I particularly liked the look of the Triple Treater Totter (try saying that with a mouthful of cat food), although I’m sure it would fling cat treats far and wide around my home. After seeing the practical gadgets, I sought some fun. 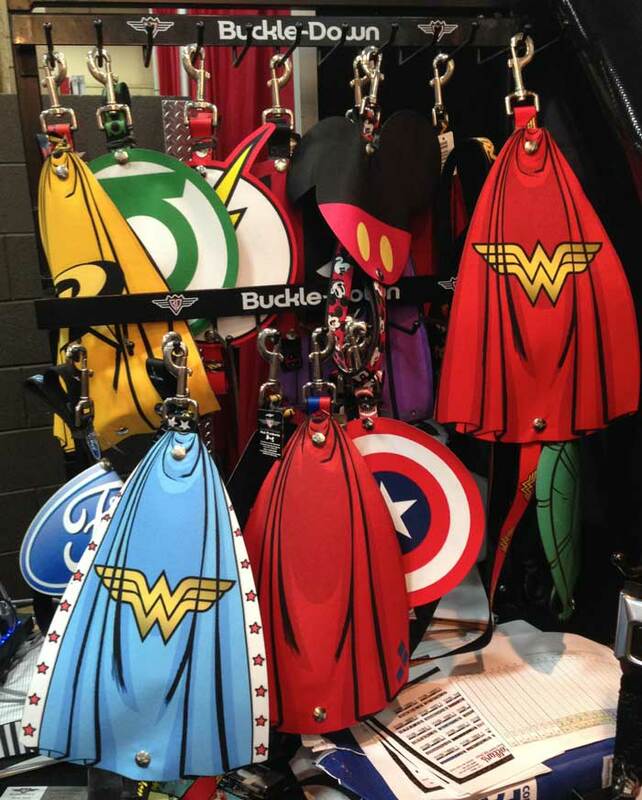 These capes from Buckle-Down are designed for dogs — they clip onto a leash or collar — but they come in smaller sizes, so you can turn your kitty into a crime-solving, criminal-smashing superhero. It’s a cat! It’s a plane! It’s Super Kitty! It’s still summer, a good time to think about Halloween costumes. I bet trying to put one on your cat will lead to a massive sulk and a large amount of howling, but if you have a docile kitty like Jim, it’s worth considering. Cat anuses? Nope, I haven’t seen any around here. 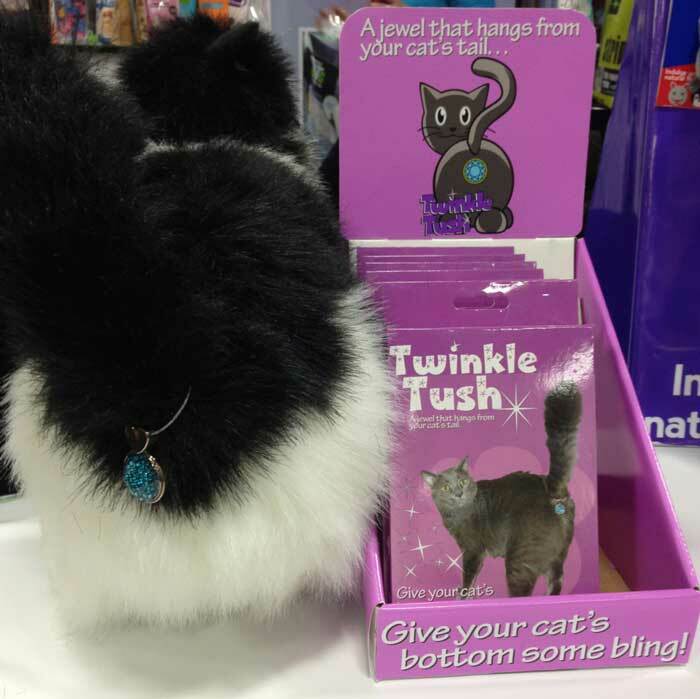 I was assured by the vendor that nobody has ever managed to get the Twinkle Tush to stay on a cat for very long — which sounds like a challenge — but I’m sure a lot of the cat folks I know, including me, will get one of these as a stocking stuffer this holiday season. It’s this year’s Unicorn Horn. I’d buy all of these for my cats with no shame at all. 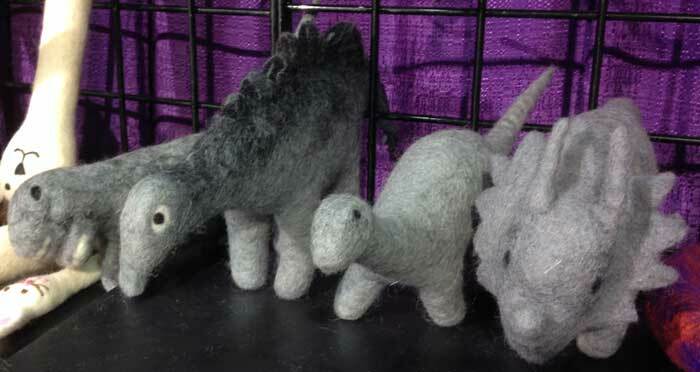 The hand-felted dinosaur toys from Le Sharma Trading Co are made in Nepal by craftswomen as part of a fair-trade program. I’ve had cats who carried around socks and even slippers, so why not dinosaurs? I would totally film my cats going to war with these woolly dinosaurs. You could substitute these for regular catnip toys and maybe rub them in a bit of ‘nip to get your cat excited. Plus you can take some adorable photos of your cat triumphing over an apatosaurus with a few well-placed bunny kicks. Janine and I couldn’t resist clowning around with the giant turkey feet from Pet ‘n Shape. You can also buy buckets of bird feet in varying sizes — something to consider hiding among the tubs of gummi sweets at Halloween. Hmm, where did I put my turkey feet? My cats eat chicken gizzards, hearts, and livers, so I’m sure they’d like to pretend they’ve just caught a giant dinosaur bird. Apparently these turkey feet are very popular around Halloween for party decorations for humans. Maybe I should make a Turkey House of Horrors. 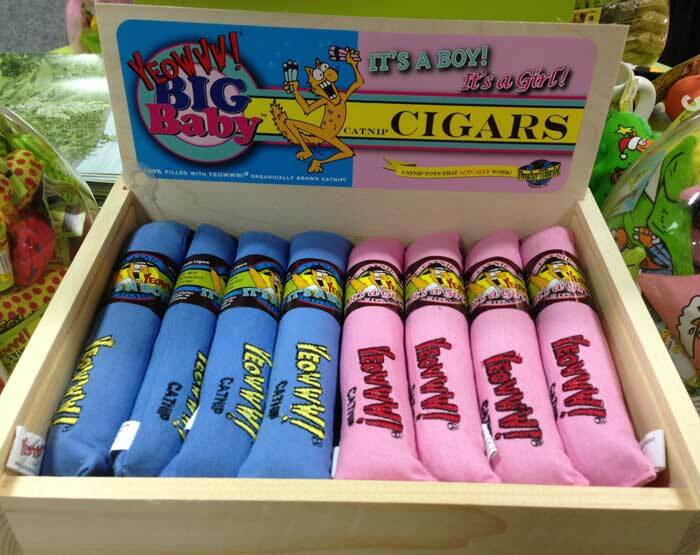 The Big Baby Cigars from Yeowww! would make great gifts for friends who’ve recently adopted a cat or given birth to a human baby. (Let’s not get into the cat parents vs. human parents discussion here, though.) It’s kitten season, so you could even buy a box and donate it to a shelter to hand out with adoptions. I’ve written about how the Yeowww! catnip cigars turned my cats into drooling buffoons, so I love this variation. 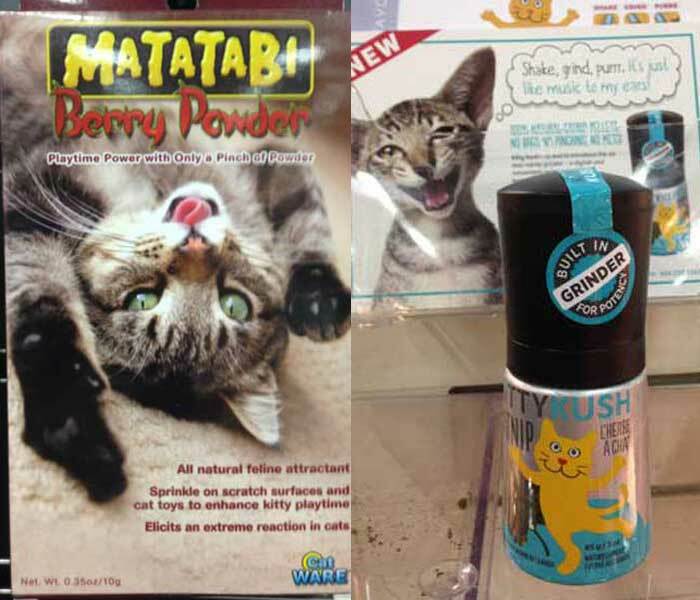 When I saw the Matatabi twigs and powder by Cat Ware I thought “Mat a tabby,” but it turns out that matatabi is another word for silvervine, which we’ve written about in other intoxicating circumstances. It trips out some cats who aren’t that receptive to catnip. Legal highs for your kitty. The Kitty Kush catnip grinder is pretty nifty, especially because we have a catnip bush out back and it’d be very civilized to grind our own dried leaves. You can shake the jar and get your cat to come running; you can also hand it over to your cat and get him to do the bunny kick on it. Much tidier than those pots and bags of ‘nip. 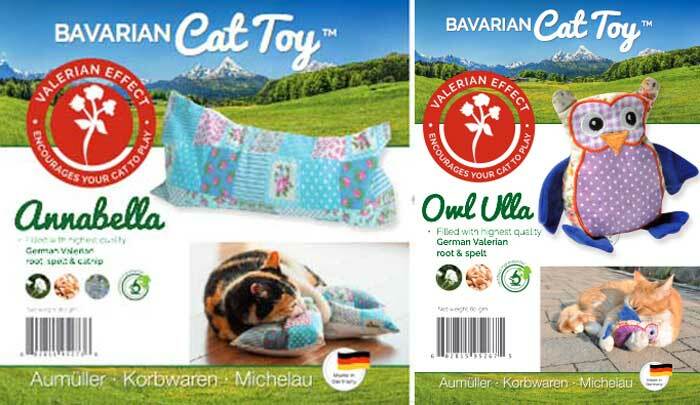 I’m also curious about the valerian pillows from Bavarian Cat Toys, which promise an invigorating playtime. These also come in larger cushion sizes so your cat can totally doze off in a happy haze. I was transfixed by this magnificent elk horn covered in velvet from Wapiti Labs. Wouldn’t you love to see a cat tree decorated with elk horns like this? Could you teach your cat to retrieve an antler? 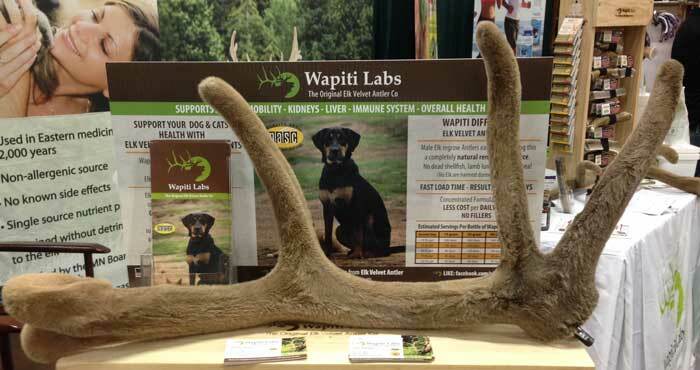 Elk horn from Wapiti Labs. It turns out that organic elk velvet may boost the immune system of people and pets alike, so it’s good for you, too. Have a cat with a strong prey drive, but don’t want to let him outside? 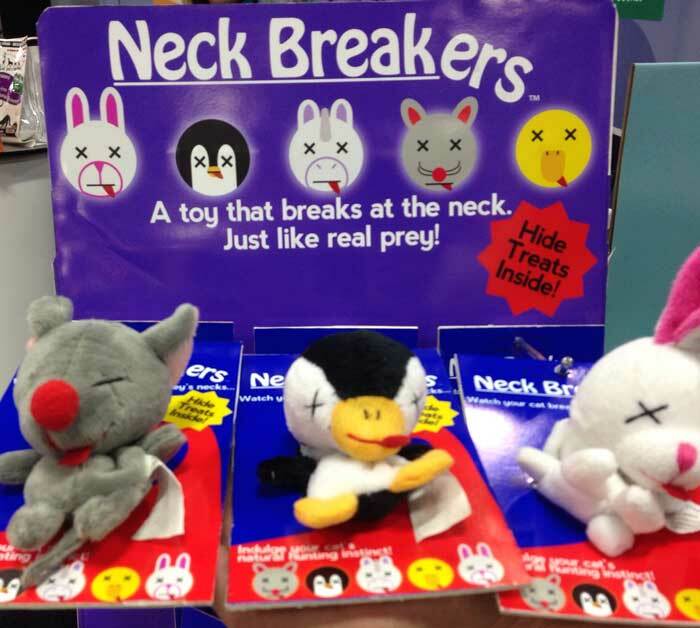 Let him kill these little critters called Neck Breakers over and over again — they’re already dead. You can load them up with cat treats or just let your cat carry their limp carcasses around your home. No real animals were harmed in the making of these toys. The Lil Chicks from West Paw Design look like little furry gonks, and they go a really long way if you hurl them across a room. 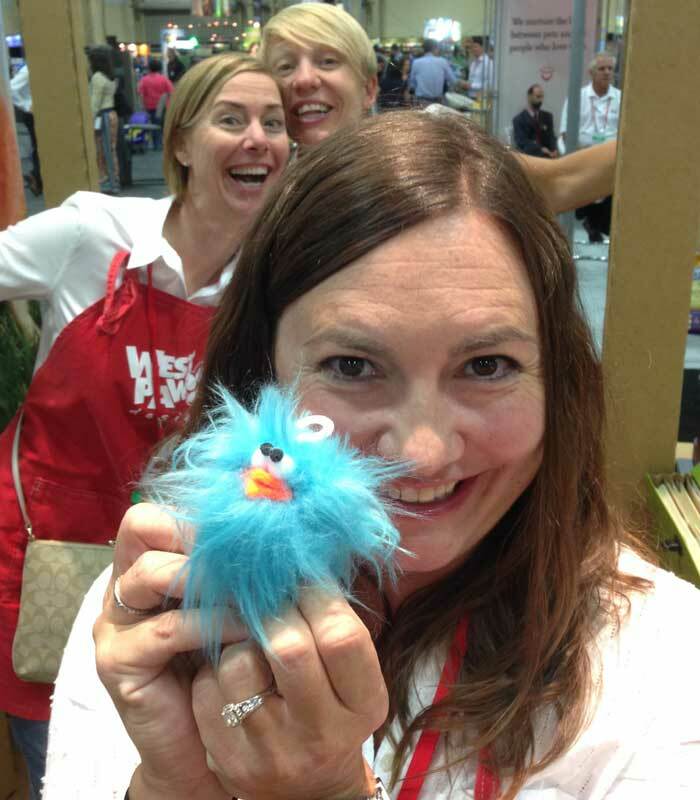 Excellent photobombing from the West Paw folks. They’re filled with USDA-grade catnip and have a bell attached. Guaranteed to end up under the couch or the refrigerator soon. 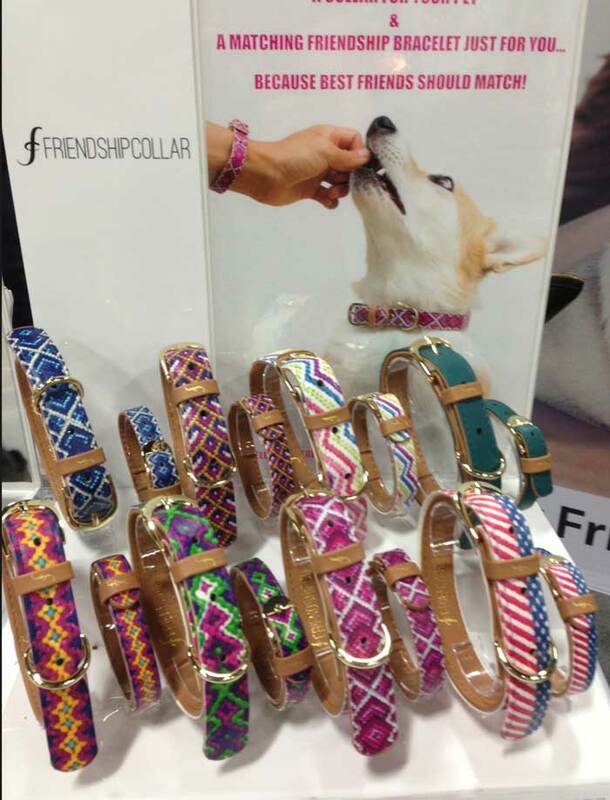 Wherever I travel in the world, I have a homing instinct for finding fellow Brits, so of course I was thrilled to chat with Bianca of Friendship Collars. You get a cute, stylish collar for your kitty, and a matching bracelet/wristband of the same pattern for you. Friendship Collars’ Instagram page is full of dogs, so I’m inviting all Catster readers to rise up and share some cat pictures there, too. 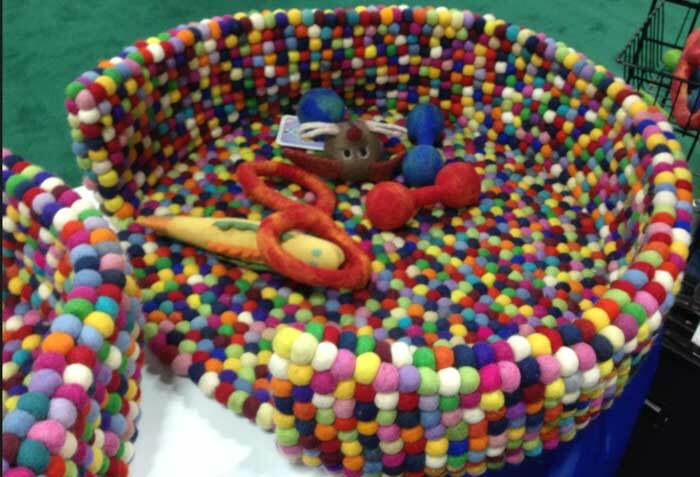 I am besotted with this bobble wool pet bed from Yeti Dog Chew and can’t stop wondering how much effort went into felting all those little balls. It might be the most labor-intensive handmade bed in the whole world. I would sleep in a human-sized version of this every night if I could. A lot of labor went into this gorgeous bed. Yeti Dog Chew specializes in yak’s milk dog treats, as you might have guessed from its name, but it is getting ready to make these gorgeous beds available in the USA. Keep an eye on its website and Facebook page; I know I’ll be one of the first in line. 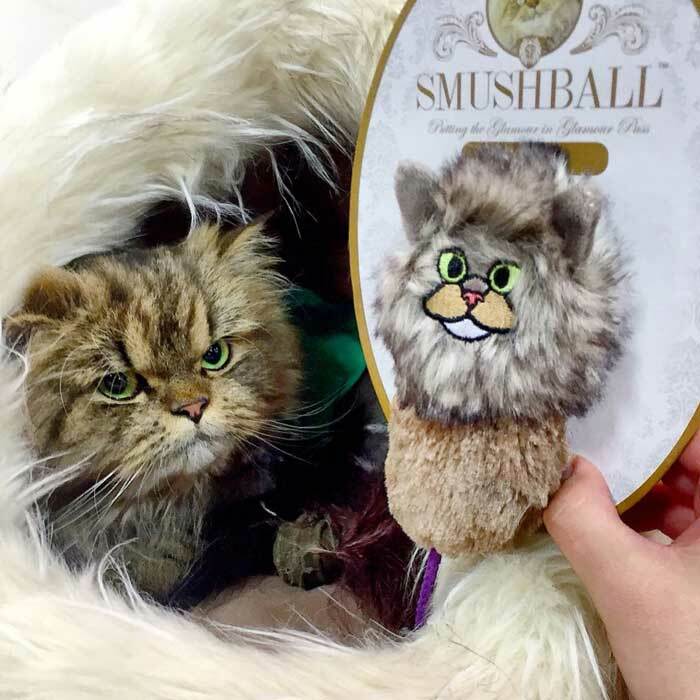 We missed out on meeting the legendary fluffy celebrikitty Smushball, but we were quite taken by the toys and harnesses bearing her name. (Where’s Luna the Fashion Kitty, the original feline diva, when you need her to model?) Unfortunately, all the products on display were merely prototypes, so we’ll have to wait. Of course there’s a resemblance. 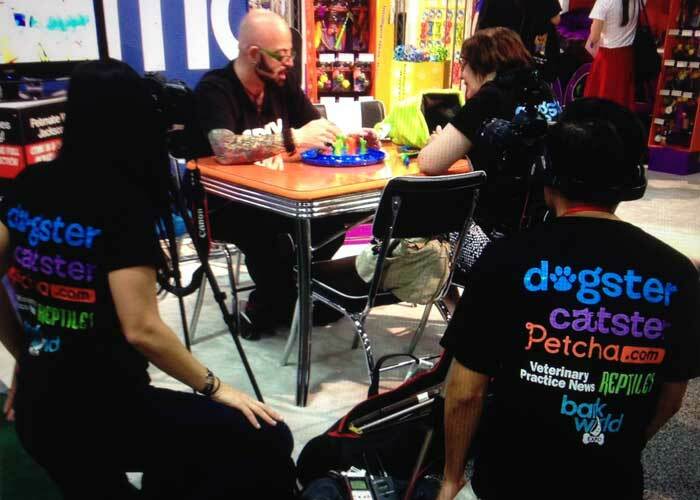 Stay tuned for more about my chat with Jackson Galaxy, and see our sister sites’ roundups: Dog Channel and Petcha. About Vicky Walker: Prickly British grammar nerd with a soft center. Obsessed with old people, history, and the contents of the litter box. Endlessly patient wrangler of two cats, one of whom may or may not be indoor-outdoor — don’t be mad. Executive editor at Catster and Dogster.